When the sun sets in Saigon, the street food vendors specializing in lunchtime rice plates and noodle bowls make way for evening offerings like roasted quail, grilled cuttlefish, and my personal favorite, sauteed corn. 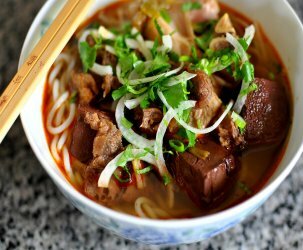 It’s impossible to resist the funky, savory, and buttery allure of bắp xào tôm bơ, especially when its enticing aroma cuts through the thick cloud of motorbike exhaust. Only in Saigon does pollution and temptation coexist so harmoniously. As much as I adored this street side staple, I hadn’t thought much of it recently until I saw corn on sale while grocery shopping this past weekend. I picked up six ears for just over a buck and got to thinking about how to best prepare my loot. With dried shrimp, scallions, and butter ready to go in my pantry, I was all set to recreate my beloved Vietnamese sauteed corn at home. While the red pepper flakes, fish sauce, and scallions each play an essential part in flavoring the buttery kernels, it’s the minced dried shrimp that take this dish to the next level. These pungent and salty little morsels punctuate each bite, transforming the corn from a very nice side dish to one that is intriguing and completely addicting. Bắp xào tôm bơ is traditionally garnished with a florescent squiggle of red chili sauce, but I generally prefer mine without in order to fully take in each caramelized and blistered bite. Now that this dish has come back into my life, it’s definitely going to be a summertime mainstay. Hello, corn season! 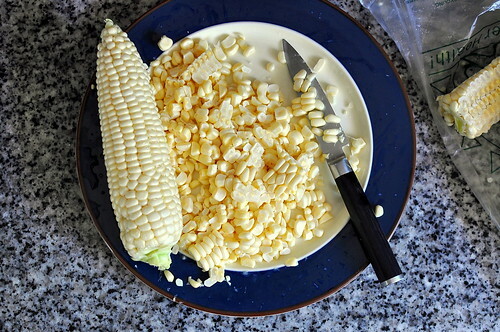 Remove the corn kernels from the cobs using a very sharp paring knife and set aside. 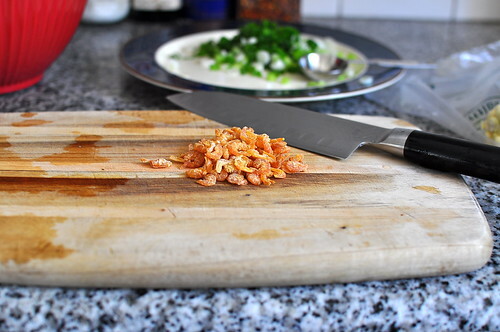 Chop the scallions, white and green parts, and mince the dried shrimp. Set aside. Melt the butter in a saute pan over medium-high heat. 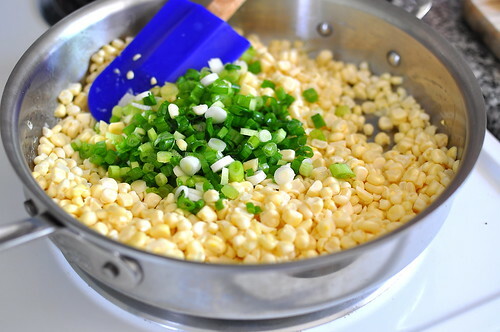 Once the butter has melted, add in the corn and scallions and saute for 2 minutes. Add in the dried shrimp, red pepper flakes, fish sauce, salt, and monosodium glutamate if using, and saute for an additional 2-3 minutes. 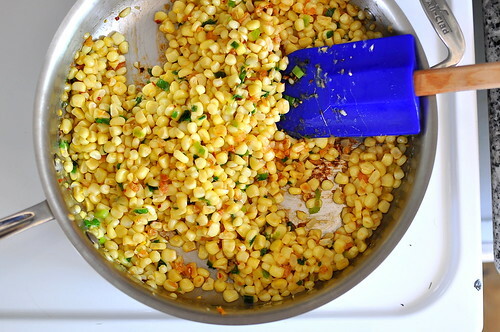 Once the seasonings have been absorbed, sample a few kernels and adjust to taste. When the scallions have wilted and the corn is caramelized and crisp tender, take it off the heat and serve immediately. 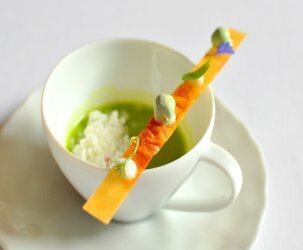 oh my glob… this looks amazeballs!!! I can’t wait for fresh corn in my hood now! Definitely making this! Chad – You can pick up a bag of dried shrimp at a well-stocked Asian grocery store. You can usually find it in the same aisle as the Chinese sausages or dried shrimp/cuttlefish. Enjoy! I’ll just have to grab some dried shrimps and make it as soon as I can. Buttery and funky in the same sentence! Must be a wondrous thing. Looking forward to that corn, baby! Thanks for the ingredient tip! I made this tonight and it was very fresh and savory. Never had had dried shrimp before, but now I’ve got some leftover and will have to find more recipes to use them in since it was so yummy in the corn! pretty much always look like tasty winners. 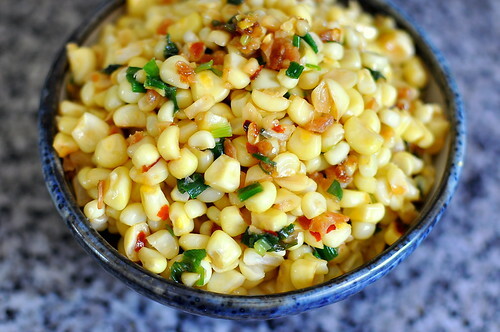 Love your recipe for Vietnamese Sauteed Corn with Dried Shrimp, Scallions, and Butter. What an interesting combination of flavours! Made this over Thanksgiving and xmas. It was a hit among the folks in the family, one of the first dishes finished every time. Doubled the amount of green onions, omitted the chili (for the kids), added some olive oil to cut down on the butter, and added a sprinkling of sugar in place of the msg. Thanks for adding to my holiday rotation 🙂 Hope your holidays were fun and delicious! Looks fantastic! Would this dish be traditionally eaten by itself or as a side dish? 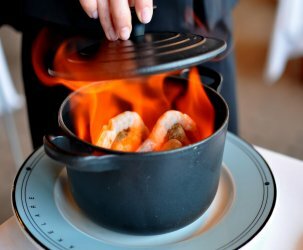 What Vietnamese dishes would you suggest to go with it to round out a meal for entertaining? Blayne – This dish is traditionally eaten as a late-night street snack. At home, I’d serve it with thit kho and steamed rice.